The Storm balance bike is one of the lightest balance bikes on the market, and as it is one of the smaller bikes around then it would be ideal for younger children learning to ride and would make an excellent 2nd birthday present. It would also be a great Christmas present for any children around this age who could grow into the bike. The Storm balance bike looks great, and little riders will love to emulate their older cousins from the 1980’s with the stand out BMX style. The metal frame means that the bike is sturdy and robust and it is available in blue, red or pink. We really love the design of the white frame with the coloured forks that give the bike a fresh and contemporary feel. Other features of the Storm balance bike include adjustable handlebars and safety rubber handlebar grips which will come in useful in the event of a fall and to help protect little hands and fingers. The saddle has an adjustable height from 35 – 43cm which means that your child can grow with the bike, however, if you are shopping for bikes with the lowest initial saddle heights then you might want to look at a rival such as the Puky LRM Learner bike which starts at just 29cm. This bike is one of the cheapest on the market and is generally available from between £30 - £40. This means it is great value and a direct competitor for bikes such as the Chicco Red Bullet Balance bike, however one drawback we found with the bike is the hard plastic tyres which would not provide as comfortable a ride as pneumatic air tyres. If your child really takes to the bike then the wheels may need replacing after some heavy use! 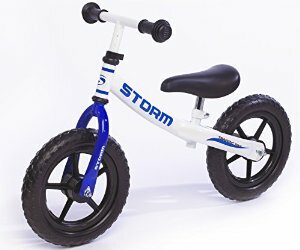 The Storm balance bike is a great choice for a starter bike and ideal for children to learn the principles of balance and steering from a young age.